For the civil use of the facility, see Tan Son Nhat International Airport. Tan Son Nhut Air Base (Vietnamese: Căn cứ không quân Tân Sơn Nhứt) (1955–1975) was a Republic of Vietnam Air Force (RVNAF) facility. It was located near the city of Saigon in southern Vietnam. The United States used it as a major base during the Vietnam War (1959–1975), stationing Army, Air Force, Navy, and Marine units there. Following the Fall of Saigon, it was taken over as a Vietnam People's Air Force (VPAF) facility and remains in use today. Tan Son Nhat International Airport, (IATA: SGN, ICAO: VVTS) has been a major Vietnamese civil airport since the 1920s. Tan Son Nhat Airport was built by the French in the 1920s when the French Colonial government of Indochina constructed a small unpaved airport, known as Tan Son Nhat Airfield, in the village of Tan Son Nhat to serve as Saigon's commercial airport. Flights to and from France, as well as within Southeast Asia were available prior to World War II. During World War II, the Imperial Japanese Army used Tan Son Nhat as a transport base. When Japan surrendered in August 1945, the French Air Force flew a contingent of 150 troops into Tan Son Nhat. After World War II, Tân Sơn Nhất served domestic as well as international flights from Saigon. In 1952 a heliport was constructed at the base for use by French Air Force medical evacuation helicopters. In 1953, Tan Son Nhut started being used as a military air base for the fledgling RVNAF, and in 1956 the headquarters were moved from the center of Saigon to Tan Son Nhut. But even before that time, French and Vietnamese military aircraft were in evidence at Tan Son Nhut. By midyear, the RVNAF had grown to thirteen squadrons; four fighter, four observation, three helicopter, and two C-47 transport. The RVNAF followed the practice of the U.S. Air Force, organizing the squadrons into wings, with one wing located in each of the four corps tactical zones at Cần Thơ Air Base, Tan Son Nhut AB, Pleiku Air Base and Da Nang Air Base. In May 1965 the Douglas A-1 Skyraider equipped 522nd Fighter Squadron was activated at the base. As the headquarters for the RVNAF, Tan Son Nhut was primarily a command base, with most operational units using nearby Biên Hòa Air Base. At Tan Son Nhut, the RVNAF's system of command and control was developed over the years with assistance from the USAF. The system handled the flow of aircraft from take-off to target area, and return to the base it was launched from. This was known as the Tactical Air Control System (TACS), and it assured positive control of all areas where significant combat operations were performed. Without this system, it would not have been possible for the RVNAF to deploy its forces effectively where needed. The TACS was in close proximity to the headquarters of the RVNAF and USAF forces in South Vietnam, and commanders of both Air Forces utilized its facilities. Subordinate to TACS was the Direct Air Support Centers (DASC) assigned to each of corps areas (I DASC – Da Nang AB, DASC Alpha – Nha Trang Air Base, II DASC – Pleiku AB, III DASC – Bien Hoa AB, and IV DASC – Cần Thơ AB). DASCs were responsible for the deployment of aircraft located within their sector in support of ground operations. Operating under each DASC were numerous Tactical Air Control Party (TACPs), manned by one or more RVNAF/USAF personnel posted with the South Vietnamese Army (ARVN) ground forces. A communications network inked these three levels of command and control, giving the TACS overall control of the South Vietnamese air situation at all times. Additional information was provided by a radar network that covered all of South Vietnam and beyond, monitoring all strike aircraft. Another function of Tan Son Nhut Air Base was as an RVNAF recruiting center. The base was adjacent to the headquarters of the Joint General Staff of South Vietnam, and was a key venue in various military coups, particularly the 1963 coup that deposed the nation's first President Ngô Đình Diệm. The plotters invited loyalist officers to a routine lunch meeting at JGS and captured them in the afternoon of 1 November 1963. The most notable was Colonel Lê Quang Tung, loyalist commander of the ARVN Special Forces, which was effectively a private Ngô family army, and his brother and deputy, Le Quảng Trịeu. Later, Captain Nguyễn Văn Nhung, bodyguard of coup leader General Dương Văn Minh, shot the brothers on the edge of the base. On 14 April 1966 a Viet Cong (VC) mortar attack on the base destroyed 2 RVNAF aircraft and killed 7 USAF and 2 RVNAF personnel. The base was attacked by the VC in a sapper and mortar attack on the morning of 4 December 1966. The attack was repulsed for the loss of 3 US and 3 ARVN killed and 28 VC killed and 4 captured. The base was the target of major VC attacks during the 1968 Tet Offensive. The attack began early on 31 January with greater severity than anyone had expected. When the VC attacked much of the RVNAF was on leave to be with their families during the lunar new year. An immediate recall was issued, and within 72 hours, 90 percent of the RVNAF was on duty. The main VC attack was made against the western perimeter of the base by 3 VC Battalions. The initial penetration was contained by the base's 377th Security Police Squadron, ad-hoc Army units of Task Force 35, ad-hoc RVNAF units and two ARVN Airborne battalions. 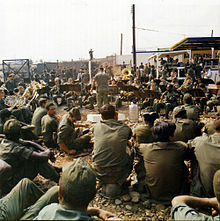 The 3rd Squadron, 4th Cavalry Regiment was sent from Củ Chi Base Camp and prevented follow-on forces west of the base from reinforcing the VC inside the base and engaged them in a village and factory west of the base. By 16:30 on 31 January the base was secured. 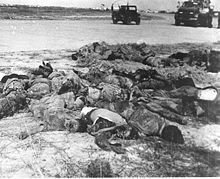 U.S. losses were 22 killed and 82 wounded, ARVN losses 29 killed and 15 wounded, VC losses were more than 669 killed and 26 captured. 14 aircraft were damaged at the base. Over the next three weeks, the RVNAF flew over 1,300 strike sorties, bombing and strafing PAVN/VC positions throughout South Vietnam. Transport aircraft from Tan Son Nhut's 33d Wing dropped almost 15,000 flares in 12 nights, compared with a normal monthly average of 10,000. Observation aircraft also from Tan Son Nhut completed almost 700 reconnaissance sorties, with RVNAF pilots flying O-1 Bird Dogs and U-17 Skywagons. At 01:15 on 18 February a VC rocket and mortar attack on the base destroyed 6 aircraft and damaged 33 others and killed one person. A rocket attack the next day hit the civilian air terminal killing 1 person and 6 further rocket/mortar attacks over this period killed another 6 people and wounded 151. On 24 February another rocket and mortar attack damaged base buildings killing 4 US personnel and wounding 21. In 1970, with American units leaving the country, the RVNAF transport fleet was greatly increased at Tan Son Nhut. The RVNAF 33d and 53d Tactical Wings were established flying C-123 Providers, C-47s and C-7 Caribous. By November 1970, the RVNAF took total control of the Direct Air Support Centers (DASCs) at Bien Hoa AB, Da Nang AB and Pleiku AB. At the end of 1971, the RVNAF were totally in control of command and control units at eight major air bases, supporting ARVN units for the expanded air-ground operations system. In September 1971, the USAF transferred two C-119 squadrons to the RVNAF at Tan Son Nhut. In 1972, the buildup of the RVNAF at Tan Son Nhut was expanded when two C-130 Hercules squadrons were formed there. In December, the first RVNAF C-130 training facility was established at Tan Son Nhut, enabling the RVNAF to train its own C-130s pilots. As more C-130s were transferred to the RVNAF, older C-123s were returned to the USAF for disposal. As the buildup of the RVNAF continued, the success of the Vietnamization program was evident during the 1972 Easter Offensive. Responding to the People's Army of Vietnam (PAVN) attack, the RVNAF flew more than 20,000 strike sorties which helped to stem the advance. In the first month of the offensive, transports from Tan Son Nhut ferried thousands of troops and delivered nearly 4,000 tons of supplies throughout the country. The offensive also resulted in additional deliveries of aircraft to the RVNAF under Operation Enhance. Also, fighter aircraft arrived at Tan Son Nhut for the first time in the F-5A/B Freedom Fighter and the F-5E Tiger II. The F-5s were subsequently transferred to Bien Hoa and Da Nang ABs. The Paris Peace Accords of 1973 brought an end to the United States advisory capacity in South Vietnam. In its place, as part of the agreement, the Americans retained a Defense Attaché Office (DAO) at Tan Son Nhut Air Base, with small field offices at other facilities around the country. The technical assistance provided by the personnel of the DAOs and by civilian contractors was essential to the RVNAF, however, because of the cease-fire agreement, the South Vietnamese could not be advised in any way on military operations, tactics or techniques of employment. It was through the DAO that the American/South Vietnamese relationship was maintained, and it was primarily from this source that information from within South Vietnam was obtained. The RVNAF provided statistics with regards to the military capability of their units to the DAO, however the accuracy of this information was not always reliable. From the Easter Offensive of 1972, it was clear that without United States aid, especially air support, the ARVN would not be able to defend itself against continuing PAVN attacks. This was demonstrated at the fighting around Pleiku, An Lộc and Quảng Trị where the ARVN would have been defeated without continuous air support, mainly supplied by the USAF. The ARVN relied heavily on air support, and with the absence of the USAF, the full responsibility fell on the RVNAF. Although equipped with large numbers of Cessna A-37 Dragonfly and F-5 attack aircraft to conduct effective close air support operations, during the 1972 offensive, heavy bombardment duty was left to USAF aircraft. As part of the Paris Peace Accords, a Joint Military Commission was established and VC/PAVN troops were deployed across South Vietnam to oversee the departure of US forces and the implementation of the ceasefire. 200-250 VC/PAVN soldiers were based at Camp Davis (see Davis Station below) at the base from March 1973 until the fall of South Vietnam. Numerous violations of the Paris Peace Accords were committed by North Vietnamese beginning almost as soon as the United States withdrew its last personnel from South Vietnam by the end of March 1973. The North Vietnamese and the Provisional Revolutionary Government of South Vietnam continued their attempt to overthrow President Nguyễn Văn Thiệu and remove the U.S.-supported government. The U.S. had promised Thiệu that it would use airpower to support his government. On 14 January 1975 Secretary of Defense James Schlesinger stated that the U.S. was not living up to its promise that it would retaliate in the event North Vietnam tried to overwhelm South Vietnam. When North Vietnam invaded in March 1975, the promised American intervention never materialized. Congress reflected the popular mood, halting the bombing in Cambodia effective 15 July 1973, and reducing aid to South Vietnam. Since Thiệu intended to fight the same kind of war he always had, with lavish use of firepower, the cuts in aid proved especially damaging. In early 1975 North Vietnam realized the time was right to achieve its goal of re-uniting Vietnam under communist rule, launching a series of small ground attacks to test U.S. reaction. On 8 January the North Vietnamese Politburo ordered a PAVN offensive to "liberate" South Vietnam by cross-border invasion. The general staff plan for the invasion of South Vietnam called for 20 divisions, it anticipated a two-year struggle for victory. By 14 March, South Vietnamese President Thiệu decided to abandon the Central Highlands region and two northern provinces of South Vietnam and ordered a general withdrawal of ARVN forces from those areas. Instead of an orderly withdrawal, it turned into a general retreat, with masses of military and civilians fleeing, clogging roads and creating chaos. On 30 March 100,000 South Vietnamese soldiers surrendered after being abandoned by their commanding officers. The large coastal cities of Da Nang, Qui Nhơn, Tuy Hòa and Nha Trang were abandoned by the South Vietnamese, yielding the entire northern half of South Vietnam to the North Vietnamese. As the war in South Vietnam entered its conclusion, the pilots of the RVNAF flew sortie after sortie, supporting the retreating ARVN after it abandoned Cam Ranh Bay on 14 April. For two days after the ARVN left the area, the Wing Commander at Phan Rang Air Base fought on with the forces under his command. Airborne troops were sent in for one last attempt to hold the airfield, but the defenders were finally overrun on 16 April and Phan Rang Air Base was lost. On 22 April Xuân Lộc fell to the PAVN after a two-week battle with the ARVN 18th Division which inflicted over 5000 PAVN casualties and delayed the Ho Chi Minh Campaign for two weeks. With the fall of Xuân Lộc and the capture of Bien Hoa Air Base in late April 1975 it was clear that South Vietnam was about to fall to the PAVN. In the final evacuation, over a hundred RVNAF aircraft arrived in Thailand, including twenty-six F-5s, eight A-37s, eleven A-1s, six C-130s, thirteen C-47s, five C-7s, and three AC-119s. Additionally close to 100 RVNAF helicopters landed on U.S. ships off the coast, although at least half were jettisoned. One O-1 managed to land on the USS Midway, carrying a South Vietnamese major, his wife, and five children. Following the war, Tan Son Nhut Air Base was taken over as a base for the Vietnam People's Air Force. Tan Son Nhut Air Base was the Headquarters of the RVNAF. It was also the headquarters of the RVNAF 5th Air Division. 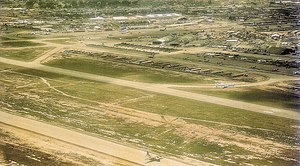 During the Vietnam War Tan Son Nhut Air Base was an important facility for both the USAF and the RVNAF. The base served as the focal point for the initial USAF deployment and buildup in South Vietnam in the early 1960s. Tan Son Nhut was initially the main air base for Military Airlift Command flights to and from South Vietnam, until other bases such as Bien Hoa and Cam Ranh opened in 1966. After 1966, with the establishment of the 7th Air Force as the main USAF command and control headquarters in South Vietnam, Tan Son Nhut functioned as a Headquarters base, a Tactical Reconnaissance base, and as a Special Operations base. With the drawdown of US forces in South Vietnam after 1971, the base took on a myriad of organizations transferred from deactivated bases across South Vietnam. Between 1968 and 1974, Tan Son Nhut Airport was one of the busiest military airbases in the world. Pan Am schedules from 1973 showed Boeing 747 service was being operated four times a week to San Francisco via Guam and Manila. Continental Airlines operated up to 30 Boeing 707 military charters per week to and from Tan Son Nhut Airport during the 1968–74 period. It was from Tan Son Nhut Air Base that the last U.S. Airman left South Vietnam in March 1973. The Air Force Post Office (APO) for Tan Son Nhut Air Base was APO San Francisco, 96307. On 1 June 1966 3rd RRU was redesignated the 509th Radio Research Group. The 509th RR Group continued operations until 7 March 1973, when they were among the last US units to leave South Vietnam. The 67th TRW was soon followed by detachments of the 15th Tactical Reconnaissance Squadron of the 18th Tactical Fighter Wing, based at Kadena AB, Okinawa, which also flew RF-101 reconnaissance missions over Laos and South Vietnam, first from bases at Udorn Royal Thai Air Force Base, Thailand from 31 March 1965 to 31 October 1967 and then from South Vietnam. These reconnaissance missions lasted from November 1961 through the spring of 1964. RF-101Cs flew pathfinder missions for F-100s during Operation Flaming Dart, the first USAF strike against North Vietnam on 8 February 1965. They initially operated out of South Vietnam, but later flew most of their missions over North Vietnam out of Thailand. Bombing missions against the North required a large amount of photographic reconnaissance support, and by the end of 1967, all but one of the Tactical Air Command RF-101C squadrons were deployed to Southeast Asia. The reconnaissance Voodoos at Tan Son Nhut were incorporated into the 460th Tactical Reconnaissance Wing in February 1966. 1 RF-101C was destroyed in a sapper attack on Tan Son Nhut AB. The last 45th TRS RF-101C left Tan Son Nhut on 16 November 1970. Unlike the USAF Farm Gate personnel at Bien Hoa Air Base, the C-47 co-pilots actually became part of the RVNAF operational structure – though still under U.S. control. Because of their rather unusual situation, these pilots soon adopted the very unofficial nickname, The Dirty Thirty. In a sense they were the first U.S. airmen actually committed to combat in Vietnam, rather than being assigned as advisors or support personnel. The original Dirty Thirty pilots eventually rotated home during early 1963 and were replaced by a second contingent of American pilots. This detachment remained with the RVNAF until December 1963 when they were withdrawn from Vietnam. Before the rotation ended in July 1970, pilots and F-102 aircraft from other Far East squadrons were used in the deployment. USAF Cessna O-1 (L-19) "Bird Dog"
The 505th Tactical Air Control Group was assigned to Tan Son Nhut on 8 April 1964. The Unit was primarily responsible for controlling the tactical air resources of the US and its allies in South Vietnam, Thailand, and to some extent Cambodia and Laos. Carrying out the mission of providing tactical air support required two major components, radar installations and forward air controllers (FACs). The radar sites provided flight separation for attack and transport aircraft which took the form of flight following and, in some cases control by USAF Weapons Directors. FACs had the critical job of telling tactical fighters where to drop their ordnance. 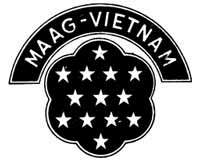 FAC's were generally attached to either US Army or ARVN units and served both on the ground and in the air. 619th Tactical Control Squadron activated at the base on 8 April 1964:278 It was responsible for operating and maintaining air traffic control and radar direction-finding equipment for the area from the Mekong Delta to Buôn Ma Thuột in the Central Highlands with detachments at various smaller airfields throughout its operational area. It remained operational until 15 March 1973. The 481st returned to the United States; the 416th returned to Bien Hoa. The first tasks facing the USAF, however, were to set up a workable organizational structure in the region, improve the area's inadequate air bases, create an efficient airlift system, and develop equipment and techniques to support the ground battle. Starting in 1965, the USAF adjusted its structure in Southeast Asia to absorb incoming units. Temporarily deployed squadrons became permanent in November. A wing structure replaced the groups. On 8 July 1965, the 33d Tactical Group was redesignated the 6250th Combat Support Group. On 15 October 1966, the 460th TRW assumed host wing responsibilities for Tan Son Nhut AB, including being responsible for all depot-level aircraft maintenance responsibility for all USAF organizations in South Vietnam. :254 In addition to the reconnaissance operations, the 460th TFW's base flight operated in-theater transport service for Seventh Air Force and other senior commanders throughout South Vietnam. The base flight operated T-39A Saberliners, VC-123B Providers (also known as the "White Whale"), and U-3Bs between 1967 and 1971. On 18 September 1966, the 432d Tactical Reconnaissance Wing was activated at Takhli Royal Thai Air Force Base, Thailand. :226 After the 432d TRW activated it took control of the reconnaissance squadrons in Thailand. With the activation of the 432d TRW, the 460th TRW was only responsible for RF-101 and RF-4C operations. In 1970 the need for improved coordinate data of Southeast Asia for targeting purposes led to Loran-C-equipped RF–4Cs taking detailed photographs of target areas which were matched with the Loran coordinates of terrain features on the photo maps to calculate the precise coordinates. This information was converted into a computer program which by mid-1971 was used by the 12th Reconnaissance Intelligence Technical Squadron at the base for targeting. Project Hawkeye conducted radio direction finding (RDF), whose main target were VC radio transmitters. Before this program RDF involved tracking the signals on the ground. Because this exposed the RDF team to ambushes, both the US Army and USAF began to look at airborne RDF. While the US Army used U-6 Beaver and U-8 Seminole aircraft for its own version of the Hawkeye platform, the USAF modified several C-47 Skytrains. Project Phyllis Ann also used modified C-47s, however, the C-47s for this program were highly modified with an advanced navigational and reconnaissance equipment. On 4 April 1967, project Phyllis Ann changed to become Compass Dart. On 1 April 1968, Compass Dart became Combat Cougar. Because of security concerns the operation's name changed two more times first to Combat Cross and then to Commando Forge. Project Drillpress also used modified C-47s, listening into VC/PAVN traffic and collected intelligence from it. This data gave insights into the plans and strategy of both the VC and the PAVN. Information from all three projects contributed in a major way to the intelligence picture of the battlefield in Vietnam. In fact about 95 percent of the Arc Light strikes conducted in South Vietnam were based, at least partially, on the data from these three programs. On 6 October 1967, Drillpress changed to Sentinel Sara. The US would go to great lengths to prevent this equipment from falling into enemy hands, when an EC-47 from the 362d TEWS crashed on 22 April 1970, members of an explosive ordnance unit policed the area destroying anything they found and six F-100 tactical air sorties hit the area to be sure. Detachments of these squadrons operated from different locations, including bases in Thailand. Each of the main squadrons and their detachments moved at least once due to operational and/or security reasons. Personnel operating the RDF and signal intelligence equipment in the back of the modified EC-47s were part of the 6994th Security Squadron. On 1 June 1969 the unit transferred to become 360th TEWS Det 1. Presidential Unit Citation: 18 February 1966 – 30 June 1967; 1 September 1967 – 1 July 1968; 11 July 1968 – 31 August 1969; l February-31 March 1971. Air Force Outstanding Unit Award with Combat "V" Device: 1 July 1969 – 30 June 1970; 1 July 1970 – 30 June 1971. Republic of Vietnam Gallantry Cross with Palm: 1 August 1966 – 31 August 1971. The 315th ACW was transferred to Phan Rang Air Base on 14 June 1967. The 315th Air Commando Wing and 8th Aerial Port Squadron were assigned to the 834th Division. :146:164 Initially the 834th AD had a strength of twenty-seven officers and twenty-one airmen, all of whom were on permanent assignment to Tan Son Nhut. The Air Division served as a single manager for all tactical airlift operations in South Vietnam, using air transport to haul cargo and troops, which were air-landed or air-dropped, as combat needs dictated through December 1971. The 834th Air Division became the largest tactical airlift force in the world. It was capable of performing a variety of missions. In addition to airlift of cargo and personnel and RVNAF training. Its missions and activities included Ranch Hand defoliation and insecticide spraying, psychological leaflet distribution, helicopter landing zone preparation, airfield survey and the operation of aerial ports. Located at: Tan Son Nhut AB; later Phan Rang AB (15 June 1967 – 1 December 1971) UC-123 Provider. Composed of four C-123 squadrons with augmentation by C-130 Hercules transports from the 315th Air Division, Tachikawa AB, Japan. Detachments were located at various points where airlift activity warranted continuous but less extensive aerial port services. Aerial port personnel loaded, unloaded, and stored cargo and processed passengers at each location. In addition, the 834th supervised transport operations (primarily C-47's) of the RVNAF, 6 DHC-4 Wallaby transports operated by the RAAF 35 Squadron at Vũng Tàu Army Airfield and 2 Republic of Korea Air Force transport unit C-46 Commandos from 29 July 1967, later replaced by C-54s. :415–6 The 834th's flying components also performed defoliation missions, propaganda leaflet drops, and other special missions. The 834th received the Presidential Unit Citation recognizing their efforts during the Battle of Khe Sanh. During its last few months, the 834th worked toward passing combat airlift control to Seventh Air Force. On 1 December 1971 the 834th AD was inactivated as part of the USAF withdrawal of forces from Vietnam. All of these units were inactivated at Tan Son Nhut AB. The 377th ABW phased down for inactivation during February and March 1973, transferring many assets to the RVNAF. :203 When inactivated on 28 March 1973, the 377th Air Base Wing was the last USAF unit in South Vietnam. Following the war, Tan Son Nhut Air Base was taken over as a base for the VPAF which is referred to by the name Tân Sơn Nhất. 917th Mixed Air Transport Regiment was moved to Cần Thơ International Airport in 2017. 25 October 1967: F-105D Thunderchief #59-1737 crashed into a C-123K #54-0667 on landing in bad weather. 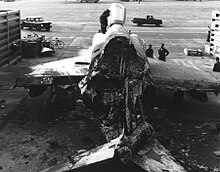 The F-105 pilot was killed and both aircraft were destroyed. ^ a b c d e f g h i j k l m n o p q r s t u v w x y z aa ab ac ad ae af ag ah ai aj ak al am an ao ap aq ar as at au av aw ax ay Futrell, Robert (1981). The United States Air Force in Southeast Asia: The Advisory Years to 1965 (PDF). Office of Air Force History. p. 52. ISBN 9789998843523. ^ a b c Tregaskis, Richard (1975). Southeast Asia: Building the Bases; the History of Construction in Southeast Asia. Superintendent of Documents, U.S. Government Printing Office. p. 32. ^ a b c d e f g h Tilford, Earl (1980). Search and Rescue in Southeast Asia 1961–1975 (PDF). Office of Air Force History. p. 14. ISBN 9781410222640. ^ a b c d e f g h i Schlight, John (1999). The United States Air Force in Southeast Asia: The War in South Vietnam The Years of the Offensive 1965–1968 (PDF). Office of Air Force History. p. 95. ISBN 9780912799513. ^ a b c d Van Staaveren, Jacob (2002). Gradual Failure: The Air War over North Vietnam 1965–1966 (PDF). Air Force History and Museums Program. pp. 126–7. ISBN 9781508779094. ^ a b c Fox, Roger (1979). Air Base Defense in the Republic of Vietnam 1961–1973 (PDF). Office of Air Force History. p. 173. ISBN 9781410222565. ^ Nolan, Keith (1996). The Battle for Saigon Tet 1968. Presidio press. pp. 9–92. ISBN 0891417699. ^ Oberdorfer, Don (1971). Tet! The turning point in the Vietnam War. Doubleday & Co. p. 148. ISBN 0306802104. ^ Thompson, A.W. (14 December 1968). Project CHECO Southeast Asia Report. The Defense of Saigon. HQ Pacific Air Force. p. 14. ^ a b c Nalty, Bernard (2000). The United States Air Force in Southeast Asia: The War in South Vietnam Air War over South Vietnam 1968–1975 (PDF). Air Force History and Museums Program. p. 36. ISBN 9781478118640. ^ a b c d e f g h Ballard, Jack (1982). The United States Air Force in Southeast Asia: Development and Employment of Fixed-Wing Gunships 1962–1972 (PDF). Office of Air Force History. p. 34. ISBN 9781428993648. ^ Markham, James (14 April 1974). "Letter from Saigon". the New York Times. Retrieved 31 May 2018. ^ a b c d e f g h i j k l m n o Tobin, Thomas (1978). USAF Southeast Asia Monograph Series Volume IV Monograph 6: Last Flight from Saigon. US Government Printing Office. pp. 20–21. ISBN 9781410205711. ^ a b c d e f g h i j Bowers, Ray (1983). The United States Air Force in Southeast Asia: Tactical Airlift (PDF). U.S. Air Force Historical Studies Office. p. 383. ISBN 9781782664208. ^ "Pan Am System Timetable". 29 April 1973. ^ Scott, Christian, J. (1998). Bring Songs to the Sky: Recollections of Continental Airlines, 1970–1986. Quadran Press. ^ Kelley, Michael (2002). Where we were in Vietnam. Hellgate Press. pp. 5–139. ISBN 978-1555716257. ^ a b Quinn, Ruth (9 May 2014). "3rd RRU arrives in Vietnam, May 13, 1961". US Army. Retrieved 31 May 2018. ^ a b c Long, Lonnie (2013). Unlikely Warriors: The Army Security Agency's Secret War in Vietnam 1961-1973. iUniverse. pp. 41–2. ISBN 9781475990591. ^ "They served in silence – The Story of a Cryptologic Hero: Specialist Four James T. Davis" (PDF). National Security Agency. Retrieved 31 May 2018. ^ Hanyok, Robert (2002). Spartans in Darkness: American SIGINT and the Indochina War, 1945-1975. National Security Agency. pp. 123–9. ^ a b c d e f g h i j k l m n o p q r s t u v w x y z aa ab ac ad ae af ag ah ai aj ak Ravenstein, Charles A. (1984). Air Force Combat Wings, Lineage & Honors Histories 1947-1977 (PDF). Washington, D.C.: Office of Air Force History. p. 254. ISBN 0-912799-12-9. ^ "Dirty Thirty Fact Sheet". National Museum of the United States Air Force. 20 January 2012. Archived from the original on 13 July 2015. Retrieved 10 May 2018. ^ Dollman, TSG David (19 October 2016). "Factsheet 38 Rescue Squadron (ACC)". Air Force Historical Research Agency. Retrieved 30 May 2018. ^ Haulman, Daniel (3 August 2017). "Factsheet 20 Intelligence Squadron". Air Force Historical Research Agency. Retrieved 30 May 2018. ^ Nalty, Bernard (2005). The War Against Trucks: Aerial Interdiction in Southern Laos, 1968–1972 (PDF). Air Force Museums and History Program. p. 90. ISBN 9780160724930. ^ "Chuyển hoạt động bay quân sự ra khỏi 3 sân bay lớn". VNExpress. VNExpress. 24 September 2016. Retrieved 29 December 2016. ^ "Wednesday 25 October 1967". Aviation Safety Network. Retrieved 30 May 2018. Airport information for VVTS at World Aero Data. Data current as of October 2006. Wikimedia Commons has media related to Tan Son Nhut Air Base. This page was last edited on 24 February 2019, at 22:20 (UTC).